Professor Antonín Kybal’s tapestry and his graduates, who gave rise to authorial tapestry in the former Czechoslovakia, intervened with the young history the most comprehensively. During his active role at the Academy of Applied Arts, Kybal also focused on his own creative work, but also theoretically utilized his knowledge of textile in numerous publications and articles. During the actual teaching he made sure that his students were thoroughly familiar with the technological essence of making tapestries, material properties, and the dyeing technique. He also pointed to other possibilities of creating tapestries, and appreciated the sense for creative experiment in students. His graduates included a number of outstanding personalities, who contributed to the shaping of textile production with their works. The period of the late 60s and early 70s is characterized by the flow of new ideas and a condensed flow of creative activities. From Slovakia, it was Silvia Fedorová, who was Kybal’s graduate, and together with him she participated in the 4th International Biennial of Tapestry in Lausanne with her work Transparent Tapestry (1968), still as a student. Her diploma thesis Textile Pole from 1970 is one of our first demonstrations of the emancipation of tapestries from walls. The artist achieved the impression of rotational movement by using various bonding, drawing inspiration from marine coral structures. S. Fedorová’s work is characterized by a variety of surfaces, structures and alternating tension between plastic and transparent elements. It exploits the possibilities of textile material, its specific characteristics, colorfulness and a wide range of bonds. Besides tapestry, the manufacturing of jewelry and clothing accessories from non-traditional materials and various non-textile materials (e.g. plastic combined with metal thread) in the bobbin lace technique is now an integral part of her work. This technique allows her to place a greater emphasis on the light qualities of the work and convey a feeling of lightness and transparency. In 1987, she received an honorable mention at the 3rd International Biennial of Lace in Brussels – a Gold Stick for her work Metamorphoses of Black And White. Fedorová’s focus is gradually shifting from bulky works of woven tapestries to smaller creations, which is ultimately characteristic for the entire textile production at the end of the 20th century. The development of tapestry in Slovakia cannot be described without prior familiarity with the issues on the territory of the Czech Republic. The first steps of Slovak artists and their contact with tapestry led through the mentioned Czech manufactures. But soon, the requirement of setting up similar workshops was also raised in Slovakia. The first is similar to attempts in the 20s including the emergence of the workshop of the Association of Applied Arts in Bratislava. 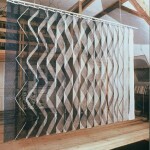 They started weaving the works of famous painters, such as Martin Benka. Certainly we cannot forget the importance of the Bratislava School of Arts and Crafts, active in the years 1928 – 1938, where Ľ. Fulla was also active. However, despite numerous attempts, these workshops were not successful according to initial expectations. Therefore, the works of Slovak artists were usually woven in Czech workshops until the situation changed due to the influence of graduates from the Academy of Fine Arts. Peter Matejka led the Studio of Monumental Painting, which in 1968 divided into two more specialized departments: Matejka’s Separation of Painting and Gobelins, and Separation of Useful and Decorative Painting, led by Orest Dubay. Listeners transformed their designs into various techniques, such as enamel, stained glass, fresco, mosaic, and so on. Matejka’s students verified their theoretical knowledge – mostly during the implementation of their diploma works, woven based on a master painting – in the Jindřichův Hradec and Valašské Meziříčí workshops. Already as graduates they were looking for some other way to implement their work, so in addition to their own studios, the requirement to set up similar workshops in Slovakia again proved necessary and current. It was a graduate of Matejka’s school, Katarína Šujanová, who initiated the establishment of workshops in 1974 in the Center of Arts and Crafts in Bratislava. Under the name of the Tapestry Center, it became for a time a place where artists could manifest their tapestries with an authorial approach, with an emphasis on the textile value of works. Works woven at the workshops were dimensional, intended mostly for the public, representative premises according to designs by Ľ. Fulla, M. Jakabčic, M. Dobeš, L. Jergušová-Vydarená, and others. For some time they still functioned as restoration workshops, but in spite of productive effort and the amount of works that originated in these workshops under the guidance of Šujanová (1974 – 1978), it was not possible to keep them active until they finally ceased to exist. The authorial creation of K. Šujanová’s tapestries is characterized by the diversity of surfaces and a significant texture, from the beginning using a wide range of bonds in her works that create a graphically acting, but plastically structured surface. The first work of the Diaries cycle was created in 1971. A characteristic feature of tapestries with this theme is a reduced but contrasting colorfulness, raster format cutting, and graphically acting line drawings. The motif consists of human body fragments, faces in profile and en face or a detail of the lips especially being dominant. We can also encounter the motif of facial profile in Šujanová’s works from a later period, as well as the distinctive range of colors, particularly in shades of red and blue. In addition to tapestries, we can find textile objects in her work from the 90s – sculptures and installations with thematically related topics – e.g. in the Communication cycle. In these works she uses the layering technique of contrast-colored profiles made of twill fabric. Her most monumental works include a spatial installation In Layers from 1994 – 1995. The cube with a footprint of 4x4m, formed by layering textile, included objects from Šujanová’s and her family’s everyday lives, from children’s toys, bags, clothes to tapestries from her early period. The placement of textiles was not incidental, layers forming a sort of geological contour, were placed in parts and had their internal logic and sense. Other graduates of Matejka’s studio who focused on the creation of unique tapestries are D. Badeková, K. Barón, E. Cisárová – Mináriková, E. Haverlová-Hrčková, J. Kornúcik, E. Lehotská, L. Jergušová-Vydarená, K. Zavarská and others. The work of Eva Cisárová – Mináriková is characterized by dialogue between the current and historical tapestries. “Referencing” – a creative process in which a fragment of someone else’s work is incorporated in the unit of the newly created work, is distinctive for her creation. 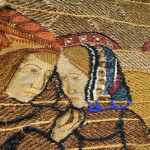 For example, in the 1975 tapestry My Interview with a Woman from Another Era, where she used a detail coming from Brussels tapestries of the beginning of the 16th century and in later works from the 80s (Confrontation with Brussels Tapestries and Recording of a Wedding Feast from 1530). Here, as in her other works, she used the rich variations of bonds and technical procedures that create authentic detail, taken from a historical basis. She also uses unconventional materials, e.g. in the piece entitled Bonnet, which is woven from various colored potato bags – paradoxically magnified to huge proportions. 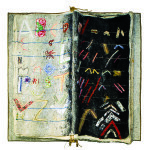 Later, the artist devotes herself to the subtler creation of textile objects in cycles Calligraphy Diary (1994), Spelling Book (1998), Samplers and Textile Books (1999 – 2000), where she combines textile with found items – readymade, nowadays especially in the creation of miniatures in which she often uses traditional textile techniques in non-traditional shapes and materials, usually wire variations. From 1990 – 2008 she worked at the Academy of Fine Arts, where she led the Studio of Fine Textile Design; in 1997 she founded the teaching of historical textile restoration at the Department of Textile, which was absent until then in Slovakia and the Czech Republic. Katarína Zavarská, who studied in Matejka’s studio, completed her studies with his successor at F. Gajdoš’ Department of Monumental Painting. Particularly in the early days of her work, Zavarská focused on woven tapestry. Later she turned from the traditional concept towards installations and non-textile materials. Her interest in textile fiber properties and structural capabilities is also dominant. A characteristic line of Zavarská’s production is the interest in figure not only in formal terms, but with all its psychological states and survival. Self-Portrait Record from 1982 – 1983 marked the beginning of her figurative work. In subsequent works with a strong autobiographical overtone she began to associate textile with the medium of photography. 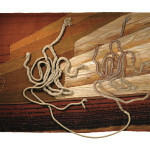 Here the next phase of her work began, a departure from tapestries to installations and the environment. 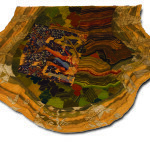 The dimensional works with the dominant theme of time and personal history that were still created through a combination of different textile techniques with woven fragments, includes works from 1988 – 1996. In the Reliquaries (1976 – 1997) cycle she presents objects in which she began to increasingly apply handmade paper and structures from natural materials in combination with photography. In the 90s she created spatial installations already far beyond the boundaries of textile art and expanded them (Wall from 1991 and Bunkers’95). In addition to graduates of the Bratislava Academy of Fine Arts, other artists with a common interested in weaving also focused on the production of tapestries. A representative of this group is Mária Rudavská. Besides weaving, she uses other hand techniques in her monumental tapestries and wall carpets, with which she puts finishing touches on her textile objects. Her work draws mainly from the folk tradition, in terms of material preferring natural fibers. Currently, Rudavská focuses mainly on pastel drawing and ceramics, which she combines with copper fiber.